Unlike so many of today’s kids, we weren’t very literate when we were toddlers. So, when we saw the masked lawman Tonto, his sidekick, galloped from out of the West, we couldn’t read the words on the screen but we were absolutely sure that he was the "Long Ranger". Well, when it comes to stretching Internet access, we can all become long-rangers. Better yet, we might be admired as the occasionally masked heroes we’ve always wished we could be. Some of us work in places that have large instructional computer labs., Frankly, we see this as a mixed blessing. On the positive side, these places are often well-staffed and they’ll have most of the software you’ll need. On the negative side, they often have to be reserved weeks in advance. Also, lab administrators want to avoid malware, so they’re typically conservative when it comes to installing new software. Many of us like to ask our students to bring their own laptops to classes, workshops, and seminars, for some hands-on sessions. At times, it would be better to install new software on an impromptu basis in each student’s personal computer. How can we do this so that everyone can quickly use the same software and have the same Internet connectivity? Quite a few workplaces have only one hard-wired Ethernet port in each locale, and, when it comes to WI-FI, it’s quite common for people in the same room to have radically different levels of wireless connectivity. In this day and age of open access, some hotels, resorts, and conference centers still continue their shameful practice of charging a lot of money for even the briefest wireless access. Let’s try several fairly inexpensive solutions. The Hard-Wired Solution: If you’re lucky enough to have a physical Ethernet port, you can split the signal with an Ethernet switch. 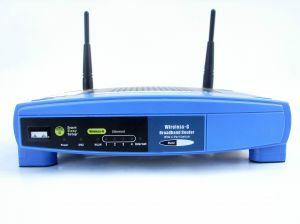 If you are using a router, it typically has four Ethernet ports built-in. Simply plug CAT5 or CAT6 cables into them, hook up your laptops, and you’re ready to go. However, you can split the signal from the router port, or any other Ethernet port with an inexpensive switch. You can get 5-port switches for less than $15 and some name-brand 16-port switches for less than $60. Depending on the cable lengths you wish, CAT5 cables can be bought for less than $5. You can even plug switches into switches. Of course, the more ports, the lower the bandwidth, and the slower the connection. This method typically is very reliable, very secure, and it still has the best bandwidth of the methods we’ll discuss, However, be prepared for a tangled spaghetti network of cables. Also, like it or not, some klutz might trip on the cables. On the other hand, this configuration has successfully snared most of the wallabies we find in New York. For a very small reduction in speed, the wiring in a building can be used as Ethernet cabling by utilizing a Broadband Over Powerline (BPL) approach. You’ll need at least two plug-in units. The "master" unit, with two connections, plugs into an AC wall socket and also to a live Ethernet connection from a router or modem. The "slave" units plug into a wall socket to receive and send signals to the master units but may have only an Ethernet port output socket. . All you need to do is to connect your laptops to the slaves with cheap CAT5 cables. Any slave unit can also be a master unit. Some have up to four active Ethernet ports. While generally reliable, this method might not work over very long distances or when a building’s wiring has noisy circuits, other electronic equipment, or poor connections. About the best advice we can give you is to buy the units but quickly return them if they don’t work for you. Expect to pay about $50 for a name-brand (CISCO, NETGEAR, BELKIN, D-LINK, and TENDA) adapter. Most work on a common protocol but, to be safe, it’s probably better to use units from the same manufacturer. The Wireless Route: The Wireless Solutions: Except for our old friend Marvin, we’ve never seen anybody trip over a wireless network. Nearly all laptops and tablets and many cell phones have wireless (WI-FI) ports. Of course, WI-FI’s are bidirectional, So, what’s to stop you from sending and sharing WI-FI signals every which way? As we’ll show you, there’s not much!